Today is February 13th and we had our 12 week scan at 4pm. I say "12 week scan" but really I'm only 10 weeks and 3 days. I was so nervous about going because last Monday I had a little bit of brown spotting but I ignored it in the hope that everything was okay - and I was right! I was so pleased that firstly, there was only 1 baby, it was healthy and the heart was beating away. The relief on Chris's that it wasn't a multiple pregnancy was a picture! He is a twin & my mums two sisters are twins, you see! We discussed my pregnancy with C, and I was told that as long as I continue to take my aspirin everyday, the preeclampsia should be kept at bay. As long as my blood pressure behaves itself, there's no reason why I can't have a natural birth. The only thing that they won't do is induce me if I go over. If I go the ten days over, they will opt for a cesarean section over an induction. Let's hope it doesn't come to that! So here we have baby #2 - due September 8th! 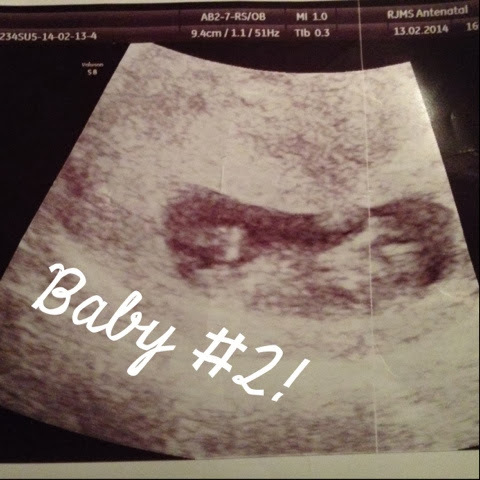 4 comments on "My 2nd Pregnancy: 12 week scan"
Wow! That's cute.Good luck Rebecca. Hello Rebecca its sweet to know that ur cute little angel is doing good and is on its way.